We love potatoes of any kind, and often think of them as the main course. 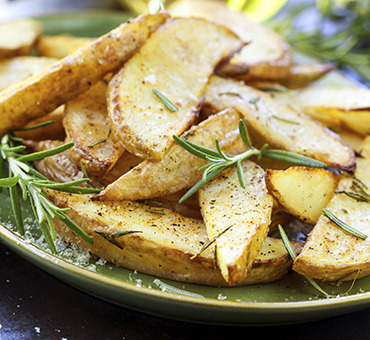 This rosemary and potato recipe has been a family favorite for a long time and is always a hit at dinner parties. Any kind of potato works, however we’re a big fan of the red, white, & purple organic fingerling potatoes. And of course, when you harvest your own fresh rosemary, it makes your dish even better. 2. Cut up your potatoes. 3. In a bowl, mix the potatoes with the olive oil and sea salt. 4. Roast the potatoes on a cookie sheet for 30 minutes, add the rosemary, and cook for another 5 minutes or until golden and crispy. 5. Harvesting your fresh rosemary is easy. Holding a sprig of rosemary at its top, cut individual springs with sharp scissors from the tallest branch. Leave a few springs intact for garnish. To strip off the needles, pinch the tip of the rosemary sprig and use your other hand to wrap your fingers around the stem below the tip. Slide your fingers down the stem to strip off the needles.